Construction is expected to wrap this winter for the Seaholm condos, with buyers who scored two years ago moving in shortly thereafter. 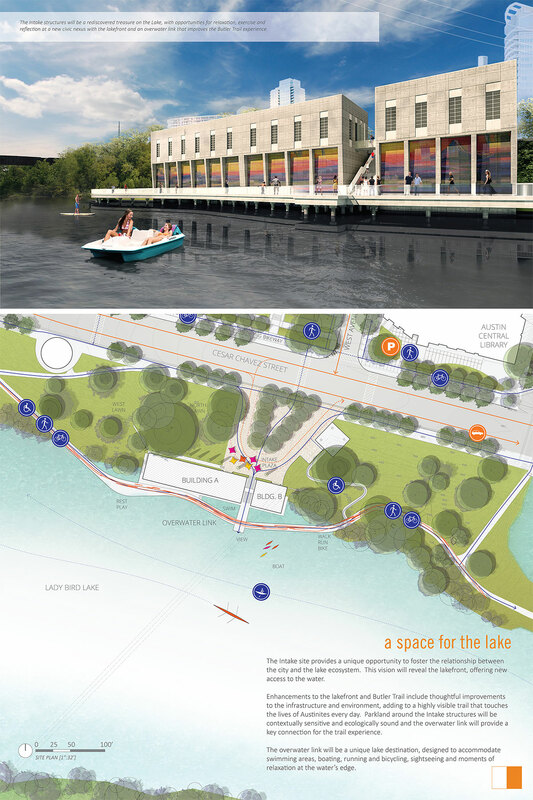 Some of you will remember way back in 2010 when former Austin City Council Member Chris Riley first publicly broached redeveloping the “other Seaholm” — the derelict intake facility on Lady Bird Lake connected to the former Seaholm Power Plant. Then, in 2013, there was a Seaholm Intake design competition. Today, I’m really excited that the Parks and Recreation Department has announced two final, refined redevelopment proposals, and opened up a survey to hear from the public. The top team will be awarded a Master Development agreement for a public-private partnership. So, I really encourage Parks to publish the survey data. Curiously, neither of the two final designs hark back to the former “top designs” released in 2013. But that is not to say that the two new final proposals are not merely more refined versions of the 2013 pitches, after structural and civil engineers got in the game. The first proposal seems very ambitious, striking and breathtaking. It would in reality redevelop the building into an entirely new structure. The metallic spiral corkscrewing through the facility, along with canopy roof, would create an iconic landmark that future generations would associate with Austin. It would probably cost a pretty penny, but if the city could partially monopolize this space for special events, then I could forsee this being an attractive option. I’m weighing it a “C” for pragmatic likelihood of getting off the ground. Compared to the other proposal, this feels like a very bland, unexciting project on the surface. But in terms of time to implement and overall cost, it seems very pragmatic. The exterior gets a face life and the interior basically becomes and exhibit hall and event venue, which is also monetizable. I’m weighing it an “A” for pragmatic likelihood of getting off the ground. The first alternative might get only a “C” for “pragmatic likelihood of getting off the ground,” but it’s a wonderful design for what could become another iconic Austin structure. The second alternative is just plain boring, and we already have more than enough “boring” in Austin. Proposal 1. The plan looks well thought out and includes a lot of details. I like many of the features and uses around the intake structure. I like the landscaping references to the original intake pipes. However, I do not like removing roughly 20% of the structure. And, I do NOT like the gondola-style roof which overwhelms the remaining intake structure. Proposal 2. The plan comes across as simple, maybe because it doesn’t offer many details. I like the structure remaining intact which preserves the industrial art-deco architecture. However, the plan don’t address the lower level uses. Unfortunately, the lack of details could make if difficult for people to back this proposal. Merge Proposal 1 exterior with Proposal 2 structure – I could support that plan. Ultimately, lack of details in Proposal 2 is not enough to overcome the dislikes I have of Proposal 1. Disappointed the survey doesn’t allow users to explain why they like or dislike the two proposals. Second one from the waterfront view looks like a rainbow prison.